Added by admin on April 10, 2018. COLUMBUS – As Ohio House speaker, Republican Cliff Rosenberger has traveled the world, often on someone else’s dime. England. France. Israel. Not to mention snazzy getaways in places such as Los Angeles and Boston.Paid for by outside groups or campaign donors – not out of Rosenberger’s $100,798 salary. A House spokesman confirmed the information in that story to The Enquirer, but declined further comment. Rosenberger’s attorney, Columbus’ David Axelrod, said the Ohio speaker has not been subpoenaed or told he is under investigation. Axelrod is not representing anyone else in the matter and declined to say when Rosenberger had retained his services. It’s unclear what about Rosenberger interests the FBI, and the bureau has declined to comment. The FBI could be asking questions about his travel – or something else entirely. And questions from the FBI may not turn into charges. Rosenberger, like other legislators, is allowed to travel for his job. He often pays for it through his campaign fund, the House GOP’s political arm or, in some cases, with a scholarship from an outside group. He must follow guidelines, such as disclosing who paid for the travel, and he cannot accept gifts worth more than $75 from an individual donor or lobbyist. In other cases, lawmaker travel is legal but raises eyebrows. For example, lawmakers around the country have received “scholarships” from the conservative American Legislative Exchange Council (ALEC) to attend fancy policy conferences. Those scholarships are paid by businesses that lobby lawmakers at the events. In some cases, lawmakers also ask donors to give money to ALEC, which ALEC then uses for those lawmakers’ travel. 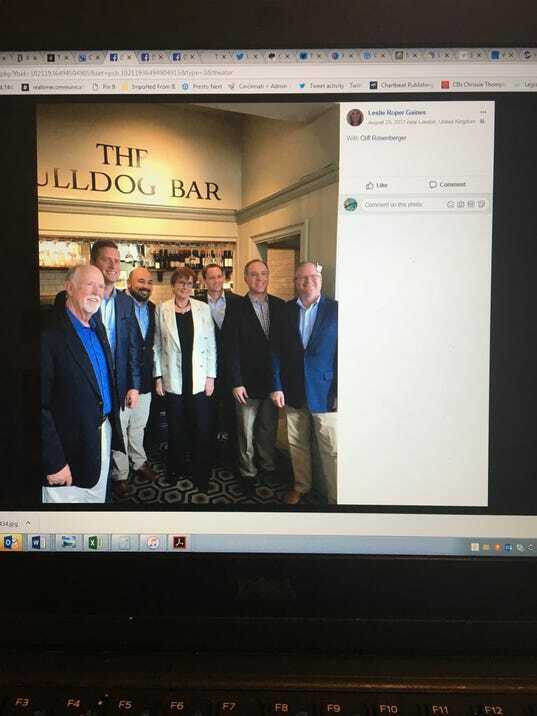 In August, Rosenberger joined five GOP leaders from other states on a four-day trip to London, paid for by the conservative GOPAC Education Fund’s Institute for Leadership Development. State Rep. Nathan Manning, R-North Ridgeville, also attended the trip, as a guest of Rosenberger, GOPAC Executive Director Jessica Curtis said. The trip, documented in Facebook photos, included a chance to meet Celia Sandys, the granddaughter of the late British prime minister Winston Churchill. 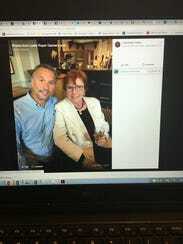 Also on the trip, according to the Facebook photos: two lobbyists for title lenders, Ohio’s Steve Dimon and South Carolina’s Leslie Gaines, who are a couple. Title and payday lenders have been trying to stall legislation that would restrict that industry. Gaines could not be reached for comment, and Dimon declined to comment on whether he discussed the legislation with Rosenberger on the trip. Rosenberger’s campaign donors paid for a dinner meeting he held in February 2016 in Key West, Florida. He spent $463 on Ambrosia Japanese Restaurant there. During the same trip, he spent $1,213 at A&B Lobster House, all from campaign contributions. He also has increased his involvement with outside groups that hold exclusive conferences and, at times, pay for lawmakers’ travel. For example, he is on the board of the National Conference of State Legislatures, a nonpartisan group that provides resources for lawmakers. In 2017, Rosenberger served as president of the National Speakers Conference, part of the nonpartisanState Legislative Leaders Foundation. Both groups sometimes pay for lawmakers’ travel, and the state of Ohio pays dues to the groups using taxpayer money. Editor’s note: A previous version of the story had a photo caption that misidentified Celia Sandys, the granddaughter of Winston Churchill.